The stoop and porch of your home are usually the first things people see when they enter your home. They can also add to the curb appeal and value of your house. It is very important, therefore, that your porch stays in the best condition possible. Foundation issues can affect your porch, garage, stairs, and whole home. If you notice your stoop is sloping or cracked, contact Reliable Waterproofing & Masonry immediately. Foundation problems are not “do it yourself” projects. They should be handled by trained professionals. Reliable Waterproofing & Masonry can help with your Virginia home. Porch piers are a potential solution when it comes to porch problems. Porch piers are drilled deep into the ground until they reach stable soil well beneath your home. 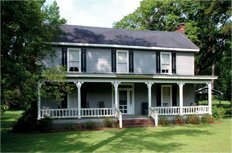 Porch piers add support and stability from those stable soils so that your porch lasts for years to come. Porch piers can help level and strengthen your porch and make it safe. Your porch or deck is an important part of the structure of your home. Without the proper support, it can cause problems for your home, and you won’t be able to enjoy it the way you would like. To have your foundation and porch inspected, contact the team at Reliable Waterproofing & Masonry today. We can see if porch piers are the right solution for your home. For all of your foundation repair and waterproofing needs contact Reliable Waterproofing and Masonry today! We want to preserve the integrity of your home and keep you and your family safe.